Well, there you have it. According to Mr. Einstein, I’m a crazy person. I like to think that I’m a crazy person with high standards, though, which just goes to show that if you believe in it enough, do zero additional research, and try the exact same method…..you’re certifiably psychotic. Psychosis works for me. Suits me, in fact. However, instead of proving the rule this time, I am the exception. For real. Edible, too! I’m actually going to go ahead and toot my own horn: It was absolutely delicious! When something goes wrong the first time, typically you assess and adjust the process for any subsequent trials. I say typically, because I didn’t. Too much effort. 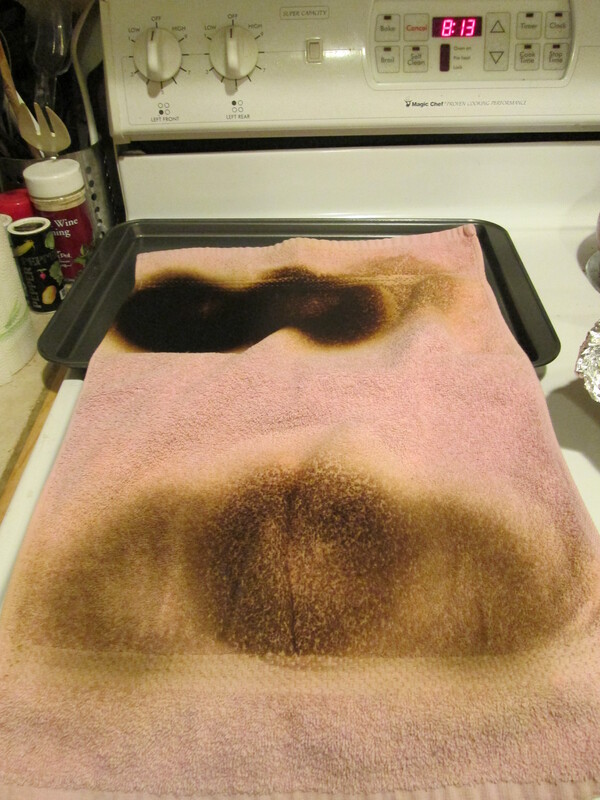 Wait, that’s a lie: I did not put towels on the stove for charring purposes this time. Yay me. 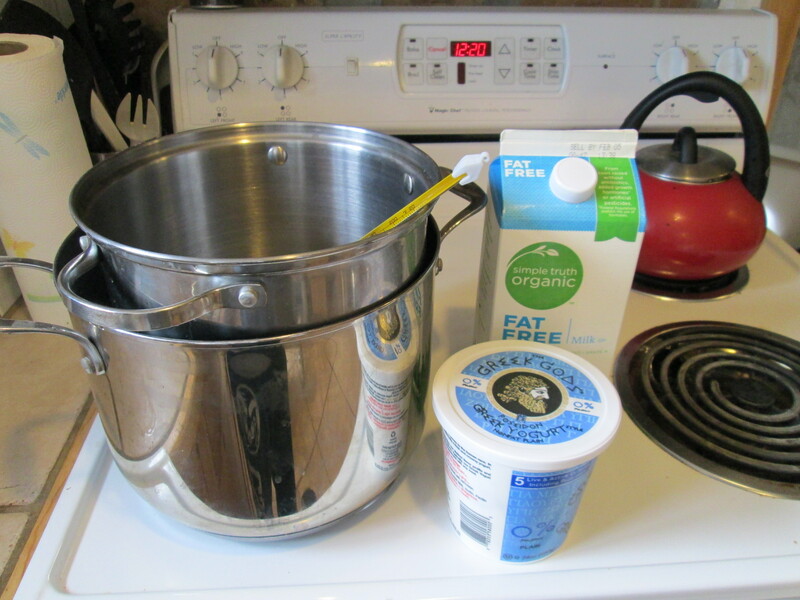 I did look at additional yogurt-making recipes, the majority of which called for either powdered milk, yogurt cultures, whole milk and whole fat yogurt, or yogurt machines. Fabulous. Couldn’t find powdered milk -it was probably right in front of me at the store; I obviously don’t do well in grocery stores-; didn’t want to use yogurt cultures since I felt it was pointless because yogurt cultures are in the yogurt you add to the mixture already; wanted a reduced-fat yogurt — I don’t buy whole fat yogurt or milk at the store in the first place, so why would I make it that way? –; and I clearly do not own a yougrt-making machine. 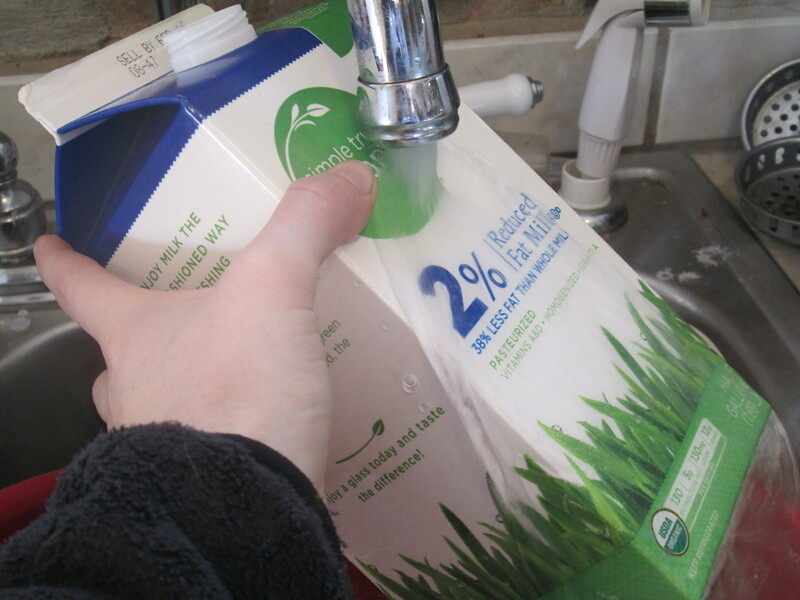 This gets slightly complicated when the top shelf of your refrigerator has decided to imitate the Arctic and make one giant ice cube out of your milk. -insert background laughter from the yogurt fates here- I’m off to a spectacular start. 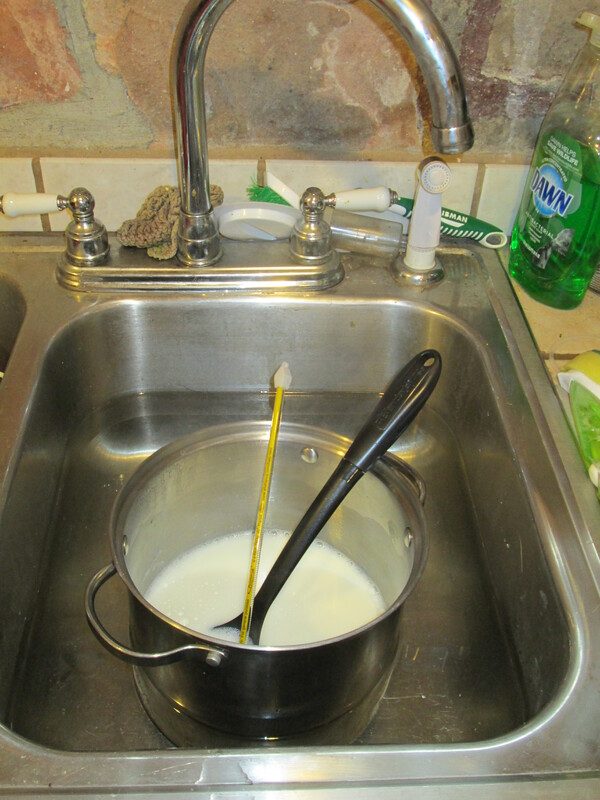 Step 1 has now turned in to: thaw your giant ice cube of milk any way you can – this may take a good half hour or so. Probably longer. 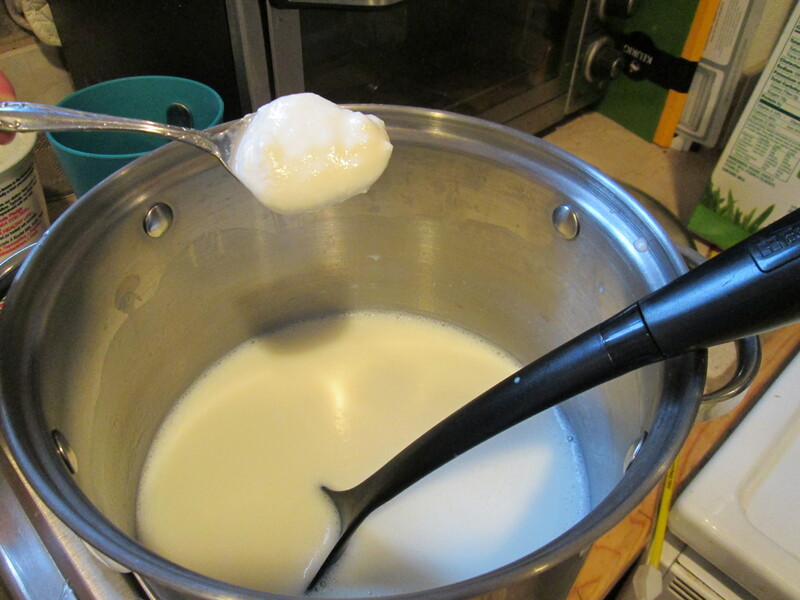 After your milk cube is thawed, pour into the top pot and bring up to 180°F for minimum a half hour, stirring frequently. 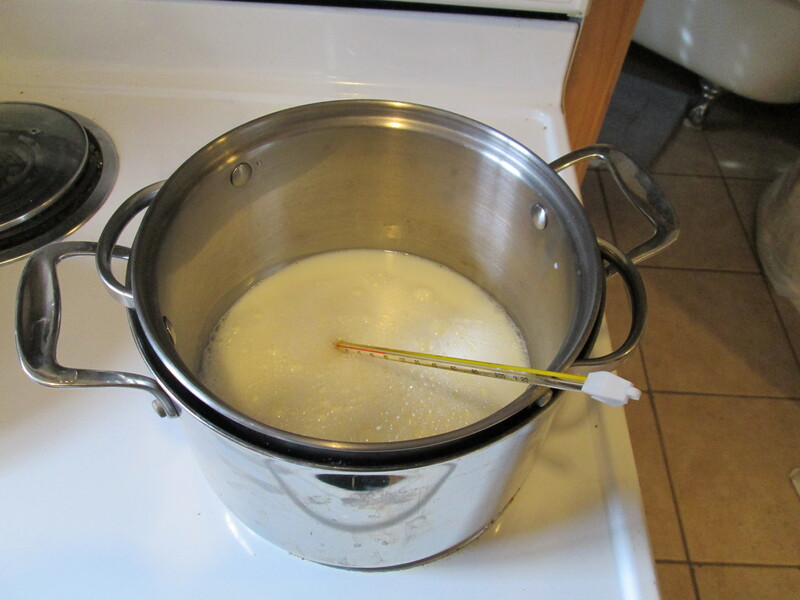 During this process, I did notice that my milk frothed quite a bit more than the skim milk for the first attempt. 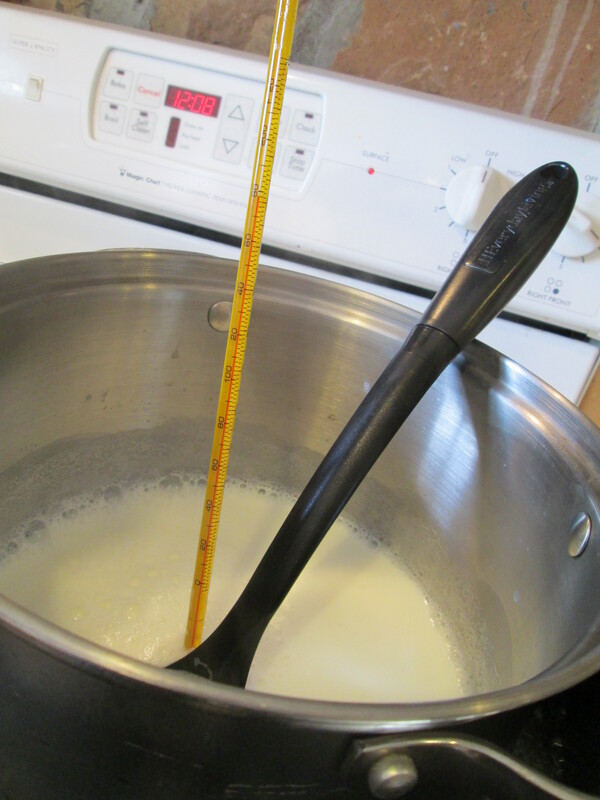 After about a half hour, cool down the milk to approximately 110°F, stirring occasionally. I did this with an ice bath in my sink. You can do it by leaving it on your counter, it will just take much longer, and goodness knows (and my family, and my friends, and my boyfriend) that I am not a patient person. 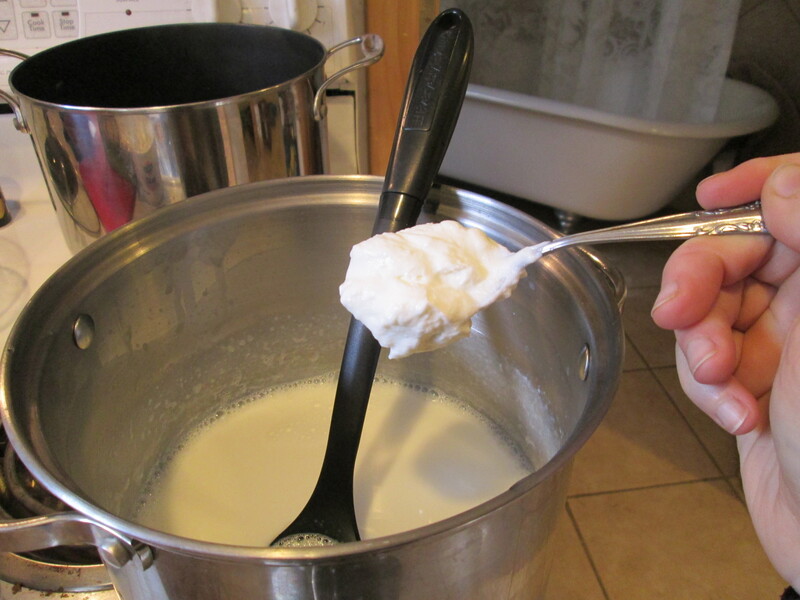 Add 1 to 3 tablespoons of yogurt (yes, you use yogurt to make yogurt) to your cooled milk. I used FAGE Total 0% for mine. 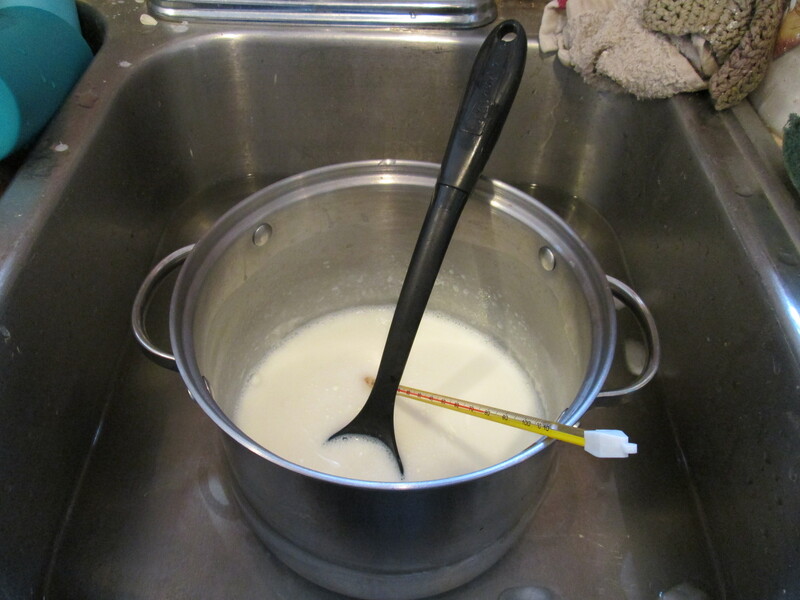 Stir this in well to your milk. 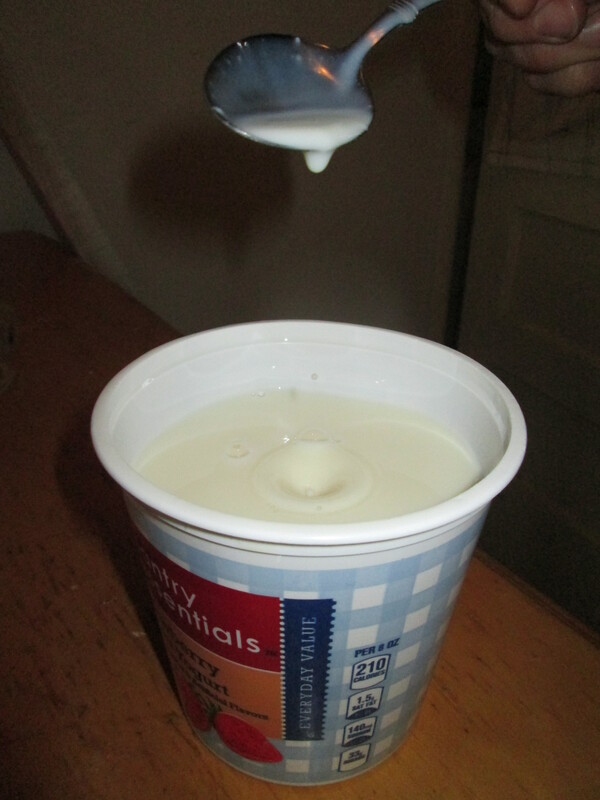 Now, you have sour, hot, yogurt milk. Congrats! 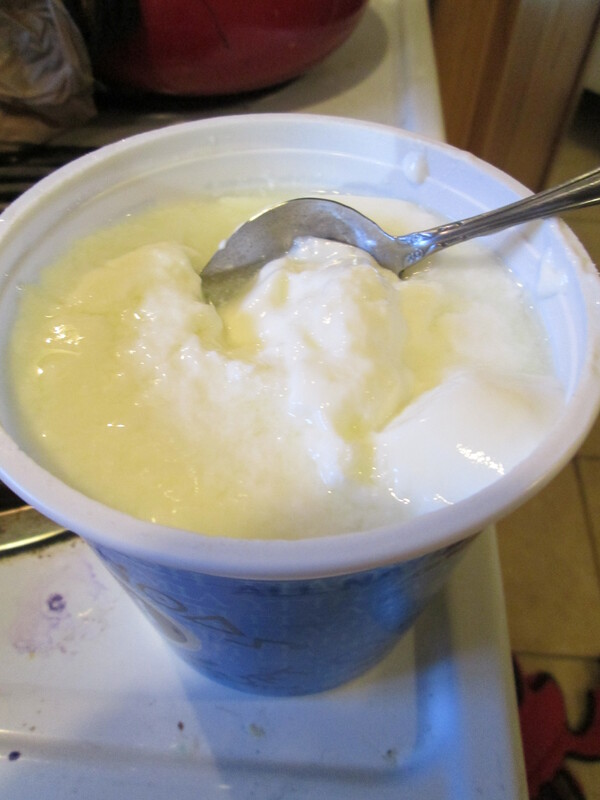 Think of it as your yogurt embryo. 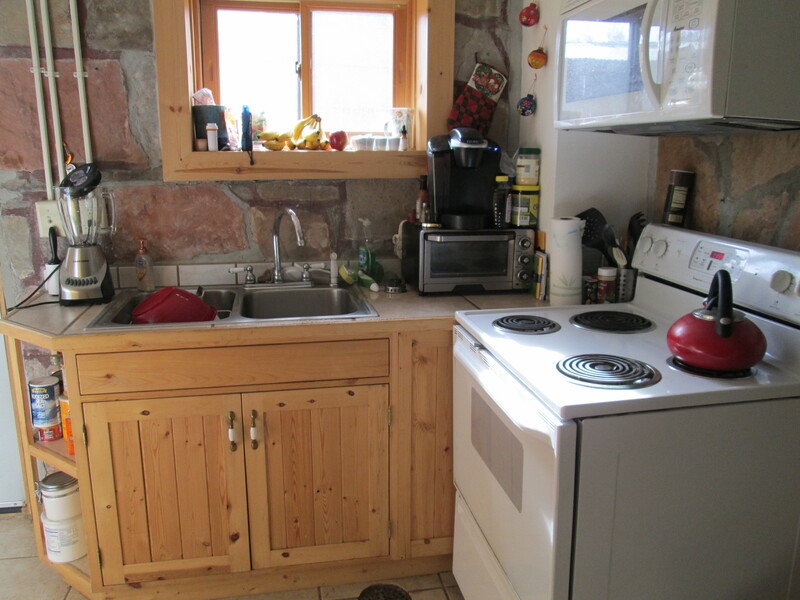 This little guy needs some TLC, and a warm, quiet place to incubate for 7+ hours. You want to keep it between 100°F and 110°F during this time. 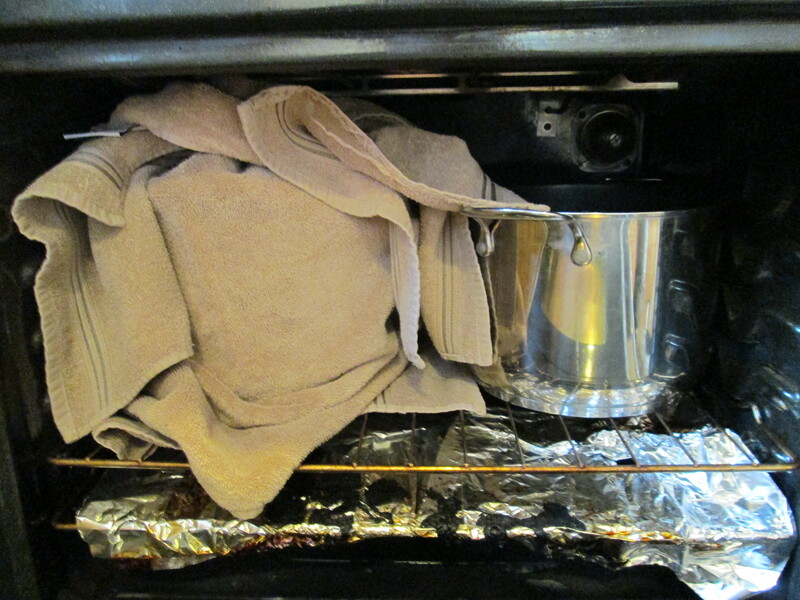 The site I originally got the recipe off of suggests a heating pad. Uh, don’t try to get super creative and invent your own if you don’t have one. It won’t work. Trust me. This time, instead of putting it on top of the oven, I decided to put it in the oven! ………I can hear your negative thoughts you cynics. Ok, ok, I deserve them. I did not turn the oven on. 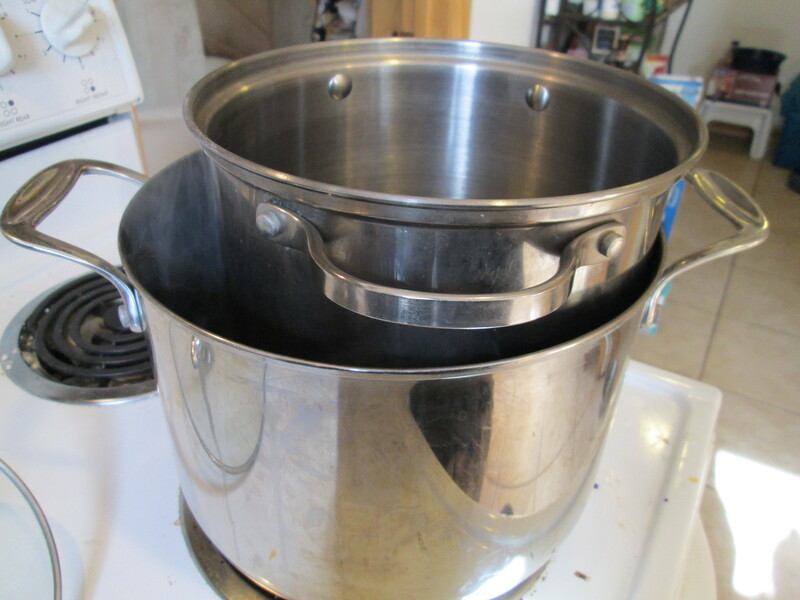 Instead, I put a lid on my yogurt embryo mixture, wrapped it in towels, and put the bottom of the double boiler (the pot that had the boiling water in it) next to it in the oven. 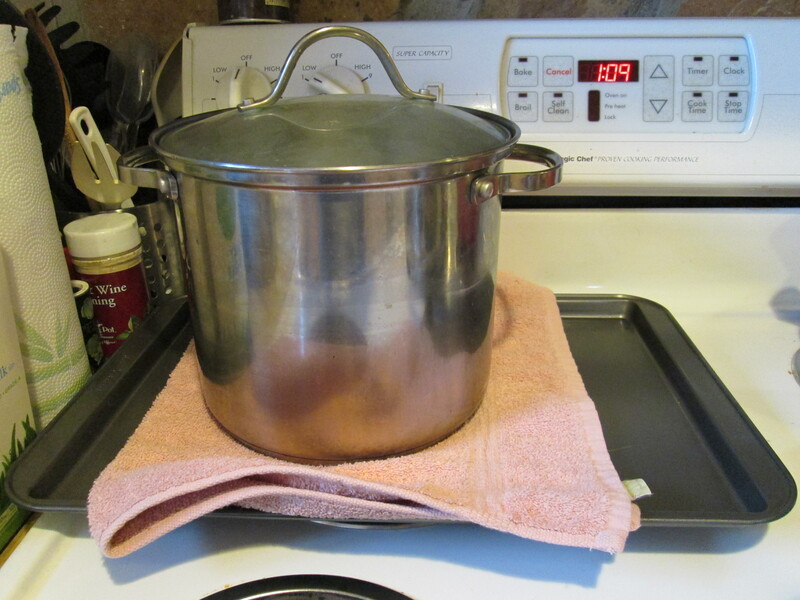 I heated up more water in a tea kettle and added that to it as well. 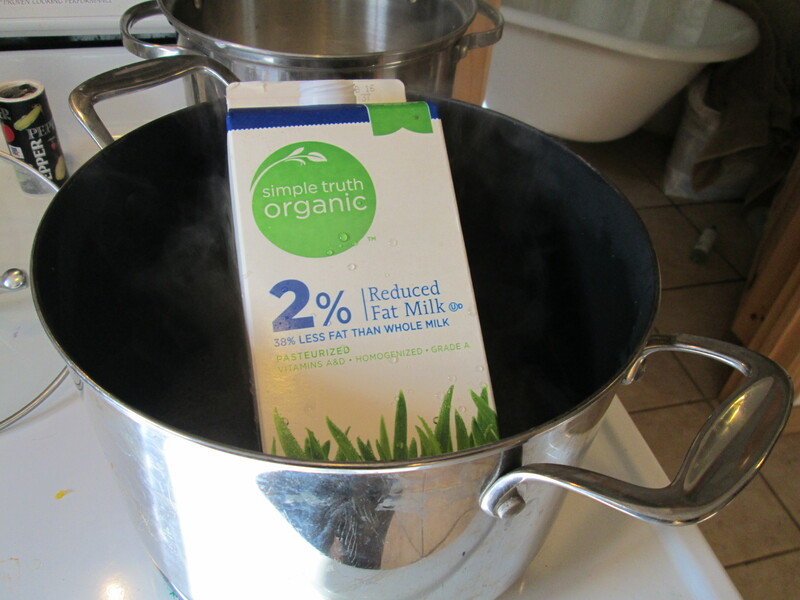 I checked on the temperature every now and then and added more hot water only once. I did it! It worked! I couldn’t believe it. 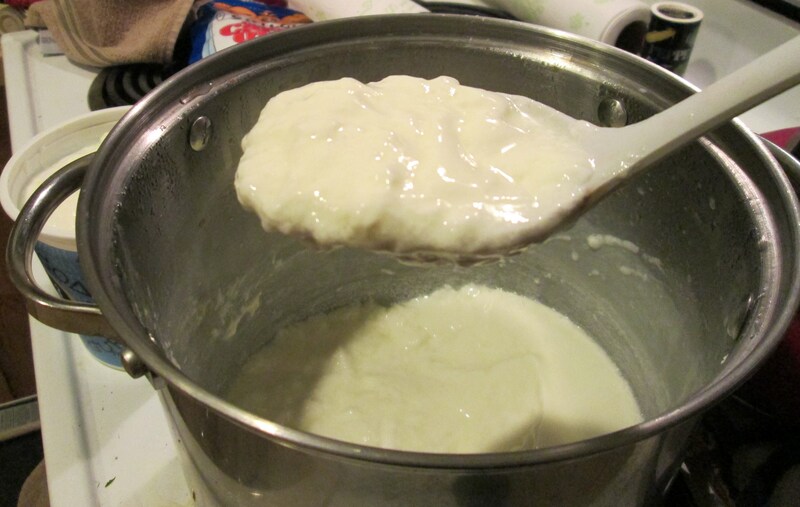 It looked like yogurt, and even kind of smelled like yogurt. 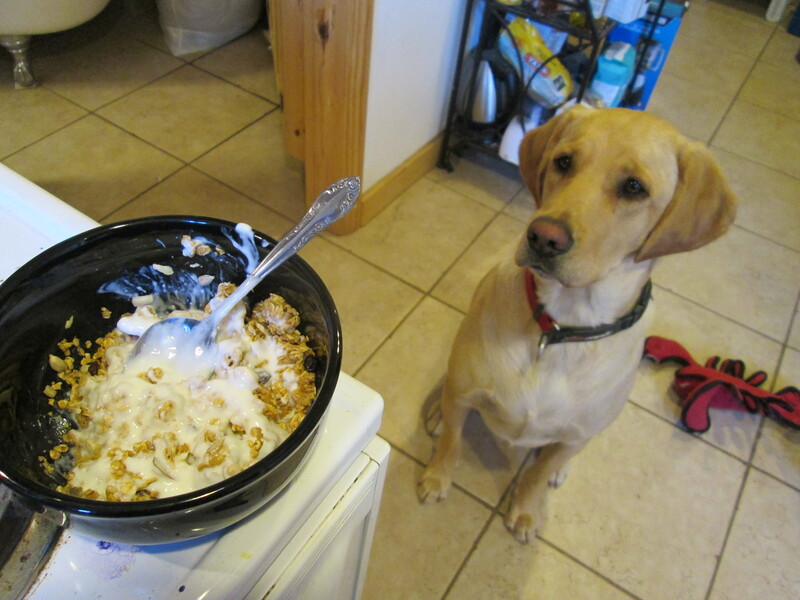 I was giddy with pleasure and the satisfaction that the yogurt fates and I had become friends come to an understanding. 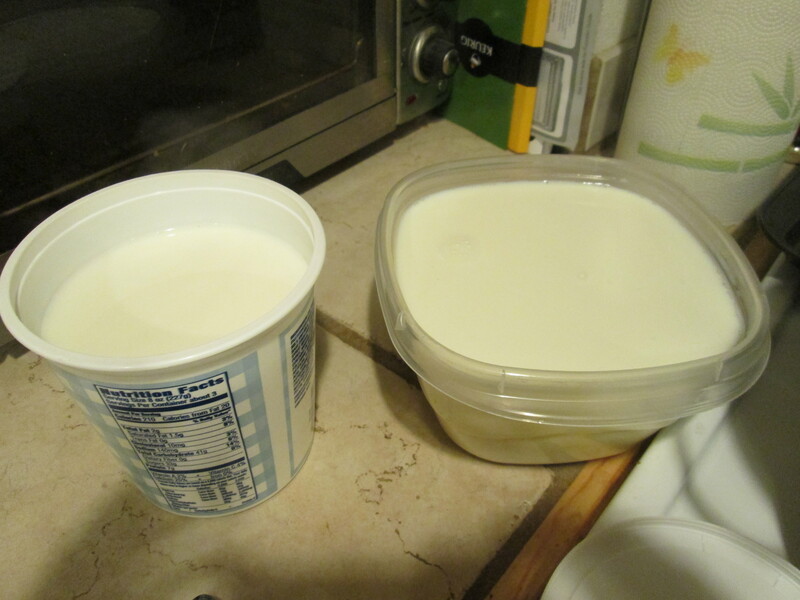 I put it in containers to refrigerate over night -NOT on the top shelf of my fridge-. The real testament would come the next morning with the first sample. Morning comes. I’m excited and slightly nervous to try it, considering it was something I made. From scratch. In the kitchen. And you just never know how that’s going to turn out. 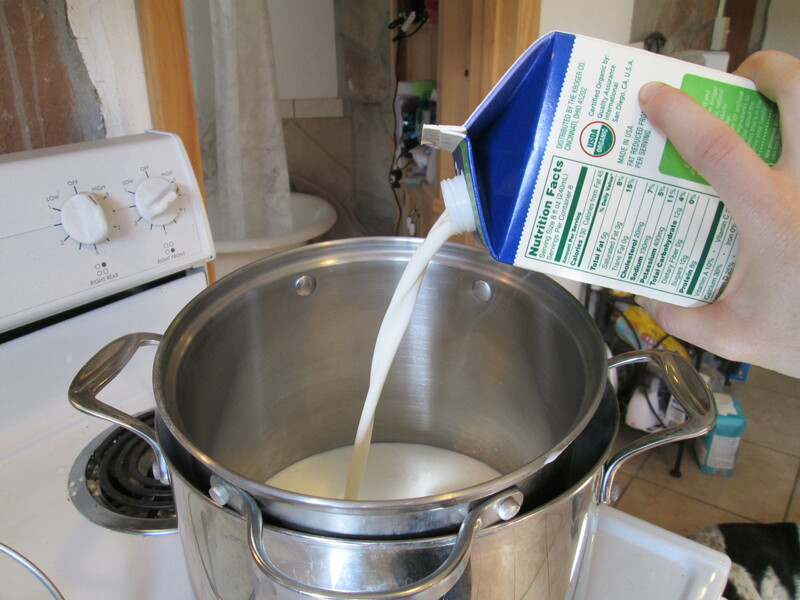 –If it works out, you ideally never have to buy yogurt again; you can use a few tablespoons from your homemade yogurt in the milk to make a new batch.- It was actually, surprisingly very good. Not as tart as I’m used to, but I was ok with that. The consistency was perfect, maybe a little less solid (is that the right word? ), but definitely not runny. I’ll just go ahead and give myself a pat on the back for that one.